Anton Franz Hoeger is German painter born 1956 in Munich. He is a member of the Vienna School of Fantastic Realism, founded by five writers and painters, including Ernst Fuchs. Although he graduated in the late 70s of the last century, he fully dedicated himself to painting only in 2000. ”Vienna School“, Hoeger’s artistic origin, is characterized by unreal, dreamy motifs in opulent Mannerist style, elaborate techniques of the old Italian and Dutch masters. 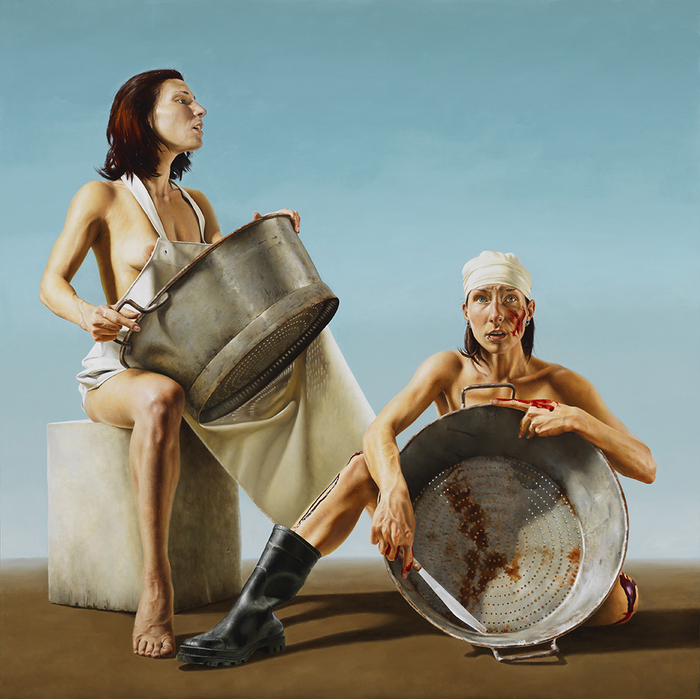 Despite the admiration towards the artistic finesse of the old masters and eccentric and dynamic Baroque painting that can be seen as a natural basis of Hoeger’s art – or Malgeschichte – his paintings contain the essence of philosophical, and go beyond the ‘pure techniques’ of his painting style. Modern artists, such as Francis Bacon, Andy Warhol, Jasper Johns or Sigmar Polke not only influenced his development, but were also partly interpreted in his work. Hoeger’s paintings are the mirror of our present existence. Kain-am I my brother's keeper? Cain can be seen as well as play a dual role. It describes also the destruction of the today's man. This painting, I did 2016, was inspird by Friedrich Hoelderlin, and a bit more of the music "Kammermusik 1958" after Hoelderlin, by Hans Werner Henze.